Being able to do amazing trampoline tricks, whether you’re a kid or adult, is such a fun way not only to impress your friends and family but also to learn it as a skill and have the ability to challenge your body and develop it as a hobby. The limitless jumping brings fun and joy to anyone who plays with a trampoline, so what better way to play than to do it with style. 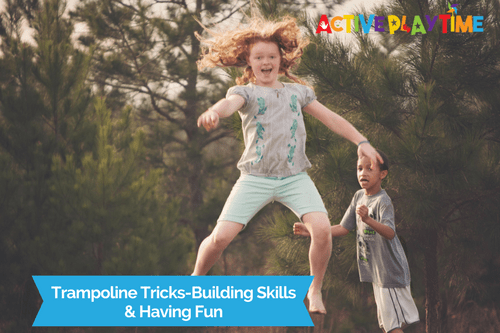 This Guide will help you learn more about trampoline tricks and simple ways to do them. But first the safety bit. Always proceed with caution before doing these stunts especially when you’re a beginner. Always wear safety gear and have supervised training when trying these tricks for your safety. The Tuck Jump is the basis of all the tricks in jumping the trampoline. This trick helps build the body gain momentum and speed. It is a simple trick that includes jumping high and then tucking the legs up midair. Start jumping up with arms extended. While jumping up, bring the knees up to your chest and touch them with your hands. Then on the way down just simply extend your arms. And put your legs down to land safely. Start jumping with the arms pointing up. While jumping up midair extend your legs to form an L shape with your body. The Straddle Jump is a bit more complex stunt but very easy to do. It requires a bit of flexibility while jumping. It involves jumping up with the legs apart in mid-air forming a simple half split then touching the toes or the legs. The Half Twist and Full Twist is a bit more difficult compared to the other stunts. It requires both momentum and timing to do the stunt properly. It involves twisting of the body while up in mid-air. The Knee drop is a basic and a very easy stunt that is the basis of drop stunts. It involves dropping on the knees as you jump. The Seat Drop is also one of the easiest tricks on the trampoline. It involves jumping and landing in a seated position with the legs extended. It is mostly used for landing safely on the trampoline. The doggy drop is a version of the knee drop yet with the arms also in a downward position imitating a dog. It involves jumping up and landing with both arms and knees in a crouch position. The front drop is a trick that involves landing flat on your stomach with arms extended. It is a very easy and basic trick for landing. Upon landing face the body to fall forward with arms extended to land safely. The backdrop is a fun and one of the most used tricks for landing. It involves landing by falling backward with legs up at a 90-degree angle. The Misty 720 is a trick that involves jumping and twisting the body in air while doing a flip. Though it may look complicated, it is very easy to do once you have mastered all the basic tricks. The back handspring requires the hand to flip the body back thus the name back handspring. It is mostly used with other tricks and is easy to do. The front handspring is a version of the back handspring but requires a bit off flexibility to achieve. This will throw the body off to another axis, by then your feet should come up behind your body. Now that you have learned some awesome tips and tricks to get you started you may need to upgrade your trampoline or even get your first one. Check out some of our Trampoline guides and reviews below.